Add a Splash of Green Sparkle to your Outfit! Perfect understated but sparkly earrings – to go with a white shirt to the office as well as a little black dress in the evening. The stones are frame set which gives the earrings some extra sparkle as light can enter the stone from all sides. The oval stone is attached flexibly to the pointy stone and sparkles with movement. 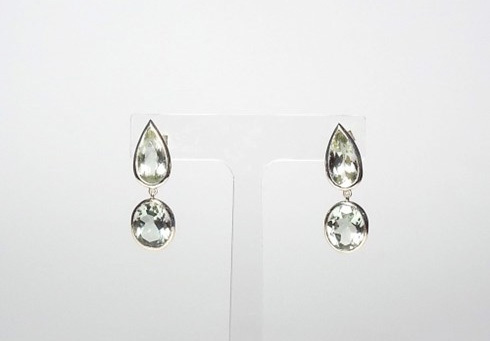 The earrings are light in weight and very easy to wear with a secure butterfly fastening.